Create realistic profiles of your current and prospective customers for stronger sales and marketing strategies. Create buyer personas that your marketing and sales teams can regularly use instead of letting them collect dust in a drawer. 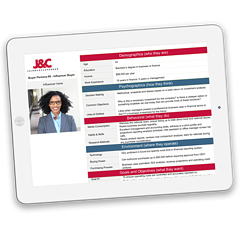 This buyer persona template will allow you to gain insight into your current and prospective customers' needs, objections and goals. Discover what motivates your potential customers and what barriers stop a sale in its tracks. With this information you'll be better able to overcome objections for a shorter sales process and happier customers. Ready for more? In today's world, customers rarely make a large buying decision by themselves. This buyer persona tool includes templates for the day-to-day user of your product or service, the influencer and the decision maker who will evaluate any product. Download the buyer persona template today to get an accurate review of your customers for stronger sales and marketing strategies.